Dr. Buchanan is a top rated cosmetic dentist in Hoover. He has the experience & credentials you should look for when selecting a new dentist for your next cosmetic dental procedure. Dr. Buchanan was recently published in the Journal of the Academy of General Dentistry and also holds the prestigious Fellowship Award from the Academy of General Dentistry. Only 6% of General Dentists in the USA & Canada have earned their AGD Fellowship. Your smile is one of the most important aspects of your appearance, and we at Greystone Smile Design offer a wide variety of cosmetic procedures. With the birth of new technology, better materials and increased knowledge, a beautiful smile is now easily within your reach! Greystone Smile Design is conveniently located just 15 minutes Southeast of downtown Birmingham with free parking. For those seeking a new dentist in Vestavia Hills, Homewood & Meadowbrook, Dr. Buchanan at Greystone Smile Design is worth the short drive from surrounding communities. Greystone Smile Design can help you achieve your dreams with a gorgeous new smile. Cosmetic dentistry is a combination of technical skill and artistic vision working seamlessly together to offer smile enhancement, restoration, and function for your optimal dental health. Using the latest techniques and the most advanced materials, we proudly offer you a stunning, natural smile and all the benefits that come with it. You will look and feel better because a beautiful smile is a healthy smile. Placing custom veneers requires a high degree of technical skill as well as attention to cosmetic detail. Dr. Buchanan places veneers routinely and designs each case individually to match and enhance characteristics already present in each patient’s teeth. When bonded to the teeth, the ultra-thin porcelain veneers are virtually undetectable and highly resistant to coffee, tea or even cigarette stains. For strength and appearance, their resemblance to healthy, white tooth enamel is unsurpassed by other restorative options. The first step is listening to your concerns and developing a plan. The most important part of our initial consultation is discussing what you don’t like about your smile. Then, we can discuss the corrections we can make. We take a series of photographs and then impressions of the teeth which will aid us in developing the perfect smile for you. We look at the symmetry of the teeth and gums. Are the gums aligned? Is there too much gum tissue that shows in the smile? Are the teeth too wide? Too short? Is crowding present, or are there spaces between the teeth? Is the smile narrow or broad? All of these areas (and many more) are evaluated when your treatment plan is being formulated. But, we don’t just look at the teeth. A smile is only made beautiful if it coincides to the entire face and ultimately to the whole person. Is your face oval, long, round, heart-shaped, or square? This also determines what smile design is best for you. The next step is to look at different smile designs to see what you like. This is done after we have determined which smiles would work best with your facial shape, your lip structure, and your jaw form. Do you like square teeth? Or more rounded? Pointed canines or more oval? All of this is done so that YOU get the exact result that YOU want. After we have compiled all of our records, formulated our treatment plan, and determined which smile design works best, it’s now time to relay this information to our ceramist to create a wax guide of our desired outcome. With the wax guide, you can actually see your new smile on the model before we actually begin the procedure. This guide will be used as the template for your temporary veneers. With our porcelain veneers, we use a minimal preparation technique. Minimal preparation means that only the necessary tooth structure is removed, which will be replaced by porcelain. This is usually only about 0.3 – 0.5 mm and the goal is to stay within the enamel of the tooth. We use reduction guides to ensure that the removal of tooth structure is uniform and as minimal as possible. An impression is taken of the preparations from which our ceramist will fabricate your porcelain veneers. 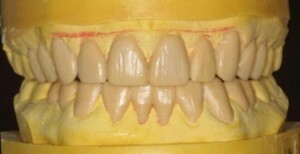 Temporary veneers are made from the wax guide and are then bonded to the teeth. You can now see what your new smile will look like! We know that it is difficult for you to try to plan your smile based off of pictures and models, so we use the temporary veneers as a “trial smile” so that the porcelain veneers are exactly what you want. This is the great advantage that cosmetic dentistry has over plastic surgery – you get to actually see the result and make changes before the process is complete and permanent. We can make any changes necessary to the temporary veneers. We can make them longer, shorter, wider, more rounded — anything! So, you leave with the temporary veneers and we urge you to critique them and make a list of any changes you would like to see made. Then, we schedule you to come back to the office in a few days and make any needed adjustments. When you are happy, we take an impression and our ceramist will use this as a guide when making the porcelain veneers. This way, YOU get exactly what YOU want – no surprises! All of the plans and preparations are finished, and all that is left is to place the porcelain veneers. You now have the smile of your dreams! And, it was made to fit YOU and it was exactly what YOU wanted! 5 aligners for minor conditions, such as very mild spacing, crowding, or orthodontic relapse. Fee includes 4 retainers (1 per year). Refinement (additional aligners) available for purchase. 7 aligners for minor crowding, minor spacing, or minor aesthetic concerns. 1 set of additional aligners included in fee. Fee also includes 4 retainers (1 per year). 10 aligners for mild crowding, minor spacing, or tooth alignment prior to restorative treatment. 14 aligners for mild to moderate cases. 2 sets of additional aligners included in fee. Unlimited aligners which allows treatment planning across a wide range of conditions. Fee includes unlimited refinements (additional aligners) and 4 retainers (1 per year). *** If a permanent fixed retainer (wire) is desired on the lower, there is a $189 additional fee. *** The records appointment requires a non-refundable $200 deposit which goes toward the total fee. The Invisalign category will be determined by Invisalign based on the pre-existing condition and goals of treatment. Payment in full is due upon case acceptance. Check with the front office regarding insurance benefits (if applicable) and financing options. Invisalign® is a new system of straightening teeth without the use of conventional braces. A series of clear plastic aligners are utilized to create tooth movement. Moving teeth with removable aligners is not new. However, the computer program, which can generate a series of aligners with small changes is the new part. Invisalign is recommended for orthodontic situations with mild to moderate spacing or crowding. They are virtually undetectable, easy to use, and comfortable to wear. Your Invisalign® treatment will consist of a series of aligners that you switch out about every two weeks. Each aligner is individually manufactured with exact calculations to gradually shift your teeth into place. And since your Invisalign system is custom-made for your teeth and your teeth only, with a plan devised by you and your dentist or orthodontist, you know you’ll end up with a smile that truly fits. Over time our teeth tend to become discolored or stained. Whether this is from smoking, coffee, or any other foods, a beautiful smile could be closer than you think! We offer a safe and permanent solution with little to no sensitivity. Whitening your teeth is a very simple procedure that can be completed in a relatively short period of time. The professional alternative to over-the-counter whitening options. It’s a simple, fast, and easy way to start a whitening treatment or for whitening touch-ups. With no impressions or custom trays necessary, it is ready to use right out of the package! Wear 30–60 minutes for 5 to 10 days. If you have had some success with over-the-counter whitening products, this may be the option for you. It’s actually a step up from the over-the-counter systems due primarily to the delivery method, which is able to hold the whitening agent against the teeth more successfully. 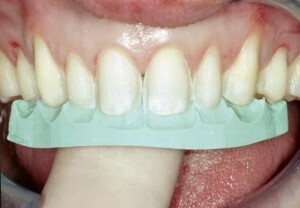 An impression of your teeth is taken and custom trays are fabricated. The whitening agent is dispensed and comes in Daytime or Nighttime products. Night White is to be used at least 4 hours overnight, while Day White is for 30 minutes during the day until desired results are achieved (1-2 weeks). Both come with 4 whitening syringes. Additional 4 syringe refill packages are $30. For those who do not like wearing the trays, 1 Hour In-Office Power Bleaching may be your treatment of choice. A protective barrier is placed over the gums and two 20 minute treatments of 35% hydrogen peroxide are completed. This procedure is comparable to Zoom, but uses chemical activation instead of light activation. Desensitizers are used before and after treatment. For more predictable results with the 1 Hour In-Office Power Bleaching, a combination of option II and III is recommended. The trays can be used before or after the Power Bleaching session and can help keep your teeth white over time. This is Option III done on consecutive days. The second session allows the bleach to penetrate the tooth more effectively resulting in better outcomes. Combination of option II and V. The trays allow you to maintain your new WHITE smile. Deep Bleaching is the most effective teeth whitening system ever developed. The Max or Ultra or Ultra-T depends on the initial shade of your teeth. If you have never been able to bleach your teeth or have never been satisfied with the results, this is your answer! This is the most predictable technique we offer. The first visit is for impressions which are sent to our lab in California for the custom tray fabrication. These trays differ from option II because they are made from a more accurate impression. Therefore, they fit against the teeth more precisely, making them more comfortable to wear. During the second visit, the fit of the trays is confirmed and the process is explained in detail (Max). And, an in-office conditioning visit is performed for the Ultra and Ultra-T. Then, the trays are worn overnight for the next two weeks (3-4 weeks for the Ultra and 6-8 weeks for Ultra-T). The final visit is what we like to call the “WOW” visit, which consists of the final in-office whitening session. The Deep Bleaching package also comes with at-home desensitizers, a patient instructional DVD, and a tray case. While you are in treatment (prior to the final in-office visit), whitening syringes are included (3 syringes for Max, 6 syringes for Ultra, 10 syringes for Ultra-T). Additional at home whitening syringes may be purchased for $30. Watch Dr. Rod Kurthy, the developer of deep bleaching, address questions and concerns about the most effective tooth whitening technique ever developed, including safety, sensitivity and before and after comparisons. The most effective teeth whitening technique ever! Dr. Buchanan has provided smile-whitening for some time now, but like many dentists, he has been frustrated that many patients do not achieve the whitening result they want, and some even have pain during bleaching. After significant research, we have now discovered the most effective tooth whitening technique ever known! Deep Bleaching is so effective that it is the only one in the world that will even whiten congenital and tetracycline discolored teeth in a short time. It’s PERMANENT, and you don’t have to give up your red wine, tea, or coffee! Dentistry has tried to achieve this for over 35 years, and now we have discovered the answer. We’ve even solved the problem of discomfort during bleaching! If you’ve been unable to bleach your teeth due to discomfort, well now you can! If you’ve been disappointed with results in the past or if you’ve been waiting for the right technique to come along — have we got a new miracle for you! If you want truly WHITE teeth, Deep Bleaching is the real deal!